Myhills has been trading in Diss since 1989. Our Diss shop stocks a huge range of pet accessories for all sorts of small animals with our range covering everything that you need to care for your faithful friend. On our first floor we have a wide selection of livestock for sale plus a comprehensive range of pet bedding and cages. If there is anything that we do not have, our friendly staff will do their best to obtain it for you as quickly as possible. 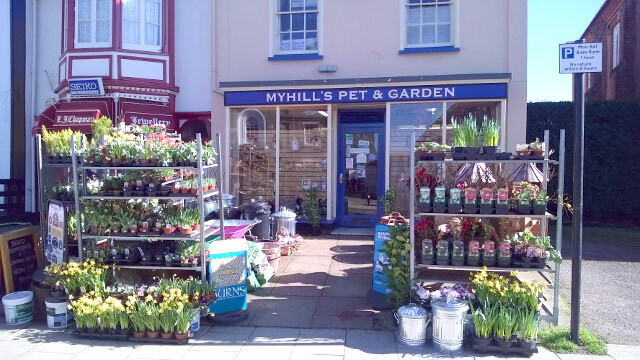 In addition to all these pet items, we have a wide range of garden lines for the keen gardener with indoor and outdoor display areas covering everything including water features, statues and ornaments, trellis, furniture and all the usual smaller sundries such as seeds, tools, compost and garden chemicals. Our delivery service is available every Tuesday for Diss and the surrounding villages (Please order by 12.00 on previous day). £1.50 within 5 mile radius of branch. Over £30 free, outside of that area please contact your nearest branch.